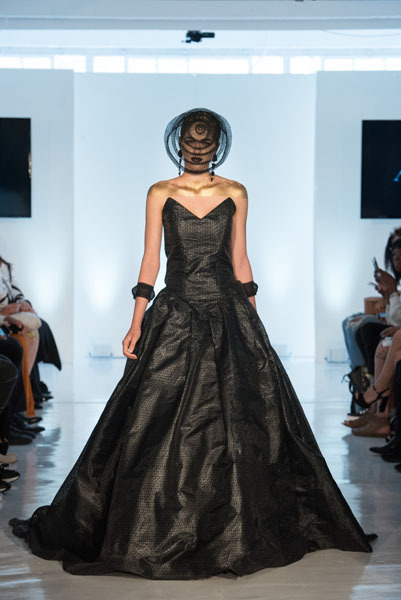 For designer Manaola Yap, intention is everything. As a hula practitioner, his designs are founded in generations of cultural tradition passed down from his ‘ohana (family). To honor his ancestors and their profound native wisdom, each dynamic MANAOLA runway show begins with traditional hula protocol and transitions into modern fashion innovation. After Yap’s oli, his sister Asialynn Yap of Hālau Manaola will channel the rain incantation “Hi’uolani I Ka Ua O Hilo.” Adorned in hand-stamped kahiko (ancient) attire as an homage to the tradition of Hawaiian bark cloth which inspire MANAOLA’s designs. The garment is used as a vehicle to transport the dancer through time and space to connect for the spiritual purpose of the oli. This particular dance honors the spiritual town of Hilo on Hawai’i Island and the sacred rains that gather to cleanse and offer blessings. The namesake of the designer, ‘ōlelo Hawai’i (Hawaiian language) translates “manaola” as “life force,” and thus the hand-crafted efforts of Yap’s creative expression transfer his own heartfelt mana (power) into his design process, ensuring quality and intention from the artist himself. Through this fundamental con- cept, Yap offers a rare perspective on indigenous art through the lens of fashion. He showcases the beauty of Hawaiian kapa (native bark cloth) adornment and the tradition of ‘ohe kāpala (bamboo stamping). Often telling a story of Hawaiian history, mythology or natural beauty, Yap hand-carves original prints onto bamboo which are inspired by repetitious patterns found in nature he deems “sacred geometry” to adorn the body. Through the lens of hula, Yap brings purpose into fashion with prints intended for heal- ing, strength and abundance, to name a few, and represents the innate Hawaiian values that nurtured his creative expressions.